You’ve probably got a rough grasp of your wardrobe must-haves for spring and summer. That would be sunglasses, T-shirts, shorts, a lightweight jacket or two and a can of deodorant the size of a fire extinguisher. You know, the usual. That’s enough to keep you sweat- and shower-proof, but if you want to be truly stylish you’ll need to put some more thought into your fair-weather threads. From the absolute essentials to the things that you didn’t know you needed (but definitely do), here’s everything to have at your disposal for the next few months plus the brands that are leading each field. Thanks in no small part to menswear types fangirling over anything and everything casual, the T-shirt has gone from weekend staple to wardrobe power player and it no longer gives a damn which day of the week it is. Heck, T-shirts are now even legit options for summer weddings such is their new-found all-rounder status. So, stock up on the soft stuff and give any decrepit dishrags the heave-ho immediately. The redoubtable boss of basics, Japanese retailer Uniqlo offers tees that tick every box – covering off pretty much every colour and fabric composition you can think of, from techy sweat-deflecting styles to timeless Breton stripes. It’s common knowledge that Nudie make reasonably priced jeans of more than reasonable quality. The same holds true for the Swedish brand’s T-shirts, which are crafted from 100 per cent organic cotton and can slide into your wardrobe for less than £50. Sunspel’s T-shirts have earned themselves a cult following for their supremely soft wear (even after many, many washes) and an ability to fit perfectly on the vast majority of the male population. Your search for the perfect T-shirt ends here. The days of choosing between swimmers which boast more square meters of fabric than a haberdashery and indecent scrap-of-cloth budgie smugglers are over. A new crop of swim shorts has arrived, bringing with them an ability to go from damp to dry in record time with the added advantages of actually flattering your physique. Choose wisely and you have a poolside pal for life. In recent years Marks and Spencer has taken directional strides towards fashion-friendly territory and that can clearly be seen in its swim shorts. Alongside pared-back trunks, there are plenty of short cuts, summer-ready prints and textured designs to dive into. Defying the terminally gloomy weather of Britain, London-based swim brand Boardies has a more optimistic design outlook with bold colour and print making up the lion’s share of its pool gear. Pick between mid and short styles depending on your level of familiarity with the local gym’s squat rack. Orlebar Brown’s field-leading swim shorts are beloved in menswear circles for their aversion to excess fabric and a love of sharp cuts, so when you’re in possession of a pair of OBs, you’ve got yourself the nearest thing to quick-drying tailoring. Sunglasses aren’t just for holidays, they’re for life. Okay, so the clouds won’t often part during winter, but at the very least you should be able to whip out a pair in spring or for the last days of autumn (as well as summer, obviously). You don’t need to overload on UV shields though: with three decent pairs in your collection you should be sorted until you inevitably lose or sit on one. Jeepers Peepers has nailed the catchy name thing, but the basic brand proposition – creating trend-led sunglasses that won’t make you miss mortgage payments – is even catchier. If you want to rock shades that make a statement once in a while, look no further. Best known for its Wayfarer and aviator styles – and probably the most named-checked sunglasses brand on the planet – Ray-Ban is skilled at producing classic shapes, limitless colour combos and robust construction, so it’s no wonder that a slavish and style-conscious following has developed in kind. Demonstrating that not all sunglasses are moulded plastic, British luxury eyewear brand Cutler And Gross makes the task of keeping premature crows feet at bay feel like an art form. Its hand-made Italian shades range from cool classics to cutting-edge and creative. From frame-swamping cargos to hotpants which scarcely cover a man’s unmentionables, there are some epically unflattering shorts out there. Tailored styles, on the other hand, hit the mark nearly every time and will help jettison that nagging feeling shorts are the scruffy option. In a neatly-cut pair you can no longer be accused of summertime sloppiness – unless you try to crack them out for a wedding, that is. With each pair hitting that sweet spot above the knee and in a comprehensive range of colours, Burton’s tailored shorts will keep your legs sweat-free and stylish, but mercifully don’t demand deep pockets to add to your summer line-up. Suitsupply makes the task of turning out sharp threads look like it’s no bother at all, so unsurprisingly the brand’s tailored shorts follow suit. Though these leg-baring beauties are mid-priced, they’re far from middling with crowd pleasing shades (sand, navy, grey) elevated by perfectly placed turn-ups and pleats. Next to fit, the most important thing to consider when trying on a pair of tailored shorts for size is fabric. Menswear maverick Alexandre Mattiussi’s brainchild AMI nails the perfect way to frame your pins thanks to garment-dyed cotton construction and off-kilter shapes which add just the right amount of design nous. We use the term ‘field jacket’ loosely. Because while an authentic M-65 style is sure to serve you well, any lightweight, earthy-coloured design replete with pockets ticks the trend box. Proffered by designers across the board, a field or safari jacket is this year’s outerwear non-negotiable. Good news, because it’s well-built for layering in winter but can go it alone when things get a little steamier. Less about flash-in-the-pan fashion than some of its high-street competitors (in aesthetics at least), Mango Man has gone on the offensive with its army of military-style jackets. Pick up its cotton-canvas style for something classic, or slide into summer with a design woven from a linen-cotton blend. The oversized bomber isn’t the only outerwear Alpha Industries excels at: there’s a lot to love about the brand’s range of field jackets too. The essence of the original M-65 shape is still front and centre but tech specs like wind and water resistance join updated design for the perfect fusion of trend and tradition. 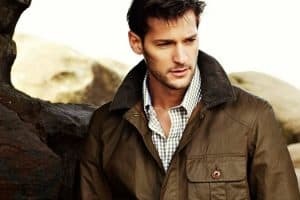 If Private White V.C.’s motto, handmade in England (Manchester to be precise), wasn’t enough to convince you to buy your field jacket local, then the fact that David Gandy practically lives in the brand’s designs should be enough to sway you. The label’s annoyingly attractive Twin Trax waxed field jacket is an excellent option for spring while a lightweight linen style will cover your (sweat-free) back when the weather picks up. There are few summer style mistakes as treacherous as a poorly chosen shirt, especially on holiday. Thankfully you’ll have no such trouble when you’re wearing a Cuban collar design. Whether plain or printed, this South American import will easily give you all the Dickie Greenleaf vibes you’ve ever wanted while playing nicely with shorts, chinos and jeans. A Riviera budget is no longer necessary to cop a Cuban collar, because high-street favourite River Island has backed the design hard for the months ahead. In fact, we’d go as far as to say it’s knocked up some of the best printed satin fabric takes on the style that we’ve seen for sub-ridiculous prices. While others were still toying with joining the Cuban collar shirt revival, Reiss was already well versed on the style’s merits, having championed them for a few seasons. As such, alongside easy to wear summer shades there’s plenty of inventive patterns to pick from, which is ideal for the early adopters out there who want to level up. Taking its cue from classic men’s workwear and tailoring, Parisian brand Officine Generale is handy at serving up Cuban collar shirts in printed and textured premium fabrics which makes the thought of shutting up shop for a life closer to the equator that little bit less insane. Backpacks may technically be more practical than tote bags, but when the weather’s not being completely awful, a rucksack has a habit of activating sweat glands in your back that you never knew you had. So for spring and summer we’ve got to hand it to the tote bag, which is practical and good-looking. A free fabric tote emblazoned with your latest ethical stance doesn’t cut it in a world where Zara has less preachy, more stylish options in slick leather, tough technical fabric and textured weaves. Add to this price tags that’ll have you nodding in approval and here’s your real bag for life. In less than 10 years, Herschel has established itself as the port of call for tote bags that combine robust construction with a comprehensive choice of finishes. Whether you want a statement accessory or just something to carry your stuff, the Canadian brand will shoulder the responsibility in style. Want Les Essentiels De La Vie may sound French and specialise in discreetly expensive tote bags that wouldn’t look out of place in some Scandinavian city, but this purveyor of low-key luxury luggage also hails from Canada. Which does nothing to alter our opinion of its unbelievably sturdy and road-ready takes on the tote. They may not top many men’s summer wish lists, but ignore this wardrobe workhorse at your peril. When you’re ready to peel yourself out of your favourite skinny jeans, a pair of lightweight cotton chinos will stride from spring to summer with ease and won’t leave you with back-of-the-knee sweat reservoirs. Among all of its wardrobe essentials, Gap’s lightweight trousers are its pièce de résistance thanks to a build quality which belies humble price tags and the fact that you can pick up chinos in almost any shade you can think of. J.Crew’s chinos have done a lot to convince the eternally averse that not every pair has to been shapeless and dull: sharp cuts, fabric sourced from some of the world’s finest mills and a price that’s palatable have helped the much-maligned trouser cure its case of bad PR. Part of the Slowear group, Incotex has become something of a yardstick against which all other well-cut trousers are measured. Prioritising the meeting of design and comfort, lightweight chinos on offer from the Italian brand come with turn ups and pressed creases so sharp even the world’s biggest style pedant couldn’t quibble. A little bit casual and a little bit dressy, desert boots are one of those rare pairs of footwear that you can stick on with jeans and a tee for the daytime and smarten up with a shirt come evening. As long as you’ve done your homework and spritzed them with some fabric protector, you can also wear and wear until you’re sick of the sight of yours, which if you’re anything like us, isn’t all that likely to happen. Suede desert boots for under £50 aren’t too common (that short nap is expensive), so the fact that Topman’s range achieves this and manages to pack some sturdy construction under the hood is all the more impressive. Clarks desert boots have been strides ahead of their rivals since their introduction in the fifties, and though the core shape has scarcely changed through the years, classic black and sand designs are now joined by modern gum sole versions to bring the offering bang up to date. With over of 150 years of expertise at its disposal, British brand Grenson doesn’t just create some of the best-looking desert boots we’ve had the pleasure of clapping eyes on, design features such as Goodyear welt construction and hardy gum soles back up the beauty with plenty of shoemaking smarts. In an unlikely turn of events the anorak has gone from by-word for style bypass to the only outerwear shape worth being seen in. It’s a win for practicality, because what’s not to love about something lightweight, foldable and waterproof? There’s no catch either, because this season’s all-singing, all-dancing anoraks have been given the enthusiastic nod from the vanguards of menswear, so you’re free to proceed without caution. Proving that tech specs need not hike up the cost of your outerwear, boohooMAN has created its own humbly priced range of anoraks which will repel rain but are sure to attract admiring glances thanks to attention-grabbing design that wouldn’t go down well on a ramble. That’s a good thing, FYI. The North Face has long been the de facto brand for a well-built weather bulwark, but once you’ve got over its scientific-sounding features, you can get similarly overwhelmed by the superficial stuff. Namely, some epic colour-block anoraks with pouch pockets that’ll render your hands invisible during the inevitable spring showers. Belstaff started life as a producer of practical waterproof clothing almost 100 years ago and later morphed into a cult luxury brand, meaning that the anoraks on offer here have some time-tested tricks up their sleeves. You’ll get features such as ventilation and taped sealed seams for starters, as well as those all-important normcore visuals.